Jeff’s exposure to farming started at an early age as he grew up on his family’s hog farm. Shortly after college Jeff found fairly quickly that his heart and passion lay with agriculture. In 2010 Jeff and his wife Emily decided to start down the path of exploring agricultural business options. His passion to stay in the agricultural industry evolved as Jeff joined Crop Quest as a nutrient management consultant early in 2013 and then launched the family’s own sheep milking operation later that fall. Today Jeff still has that same passion for nutrient management and farming. Jeff is a board member of Southwestern Ontario Dairy Sheep Farmers, being actively involved in a small part of the dairy sheep industry development. Jeff and Emily are milking close to 300 sheep and are realizing their dream to be farmers and entrepreneurs along with their four busy boys. Jeff has been completing nutrient management strategies and plans since joining Crop Quest in 2013. He has developed a vast knowledge of many different livestock types. This has allowed him to assist clients in building projects from siting, sizing and MDS calculations of their new barns and manure storages all the way to manure spreading plans; helping farmers get the most out of their valuable resource they have in manure. 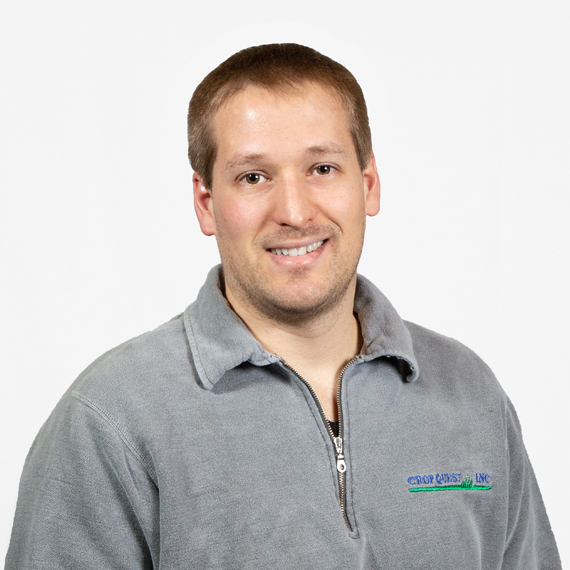 Jeff is available to assist clients with their nutrient management needs.